The Goddard School believes that the basis for healthy learning is providing all children with active, playful lifestyles enriched with good nutrition. From Monday, September 19th through Saturday, September 24th, 2011, Goddard Schools nationwide will host The Goddard School Block Party event in an effort to spread the word to families in their community. Children and their families will engage in a variety of exciting fitness, nutrition and playful learning activities based on the core curriculum and enrichment programs that are an integral part of the FLEX™ Learning Program offered at The Goddard School. For the second year in a row, Goddard Systems, Inc. (GSI), franchisor of The Goddard School, is the exclusive preschool sponsor of Play for Tomorrow’s Ultimate Block Party: The Arts and Sciences of Play, a powerful global movement designed to recognize and celebrate the power of play for learning. In addition to The Goddard School Block Party event taking place in our Schools, GSI will participate in the Ultimate Block Party (UBP) on Sunday, October 2nd, at Rash Field in Baltimore’s Inner Harbor in downtown Baltimore, MD. The UBP will feature an amazing day of play for families and children, designed to bring playful learning back to the forefront. At the event, GSI and the Baltimore-area Goddard Schools will host the Let’s Play Café. Children will enjoy manipulating play dough, shopping at a pretend farmer’s market and participating in a series of engaging pretend restaurant activities while learning about nutrition, counting, sorting and other important lessons through play. To learn more about The Goddard School Block Party and The Goddard School, parents are encouraged to visit www.goddardschool.com/blockparty or call 1-800-GODDARD. Turn on Those Listening Ears! 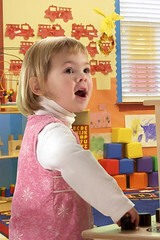 Have you found it challenging to capture your preschooler’s attention these days? Many parents try speaking louder or may yell out of frustration. While yelling can be scary for children, those who hear it often may simply tune it out. Your child may be ignoring you on purpose, exercising their “selective hearing” or just daydreaming. Pssst! Here’s a hint—try whispering! A whisper can prompt your child to feel that something “secret” or “super special” is about to be said—and that’s something most preschoolers can’t resist! How do you gain your child’s attention? With your toddler asserting a newly discovered feeling of independence, you may find yourself at your wits’ end. Tasks that were once a piece of cake—from buckling a car seat, brushing teeth and getting dressed to grocery shopping and mealtimes—can be a big production these days. Now that your child is testing the waters of freedom—getting bigger, stronger, faster, and simultaneously discovering the word “No!”—you might wonder how to regain control. Consider these tips for guiding your child toward good behavior. Choose your battles. While it is critical to not give in on some things (seat belt use, holding hands when crossing a street, etc. ), sometimes you have to pick your battles. If your child refuses to get dressed, sometimes you just need to call it a pajama day—easy to do on a day off! If she refuses her meat and veggies at dinner time, don’t make it a big issue. She’ll eat when she is hungry. Just continue to put healthy, well-balanced choices on her plate or tray at each meal and eventually she’ll try them. How do you guide your child toward good behavior?